These are fun for a whole class to make. 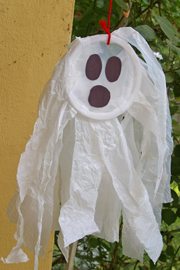 You can hang the ghosts from the ceiling, or just let the preschoolers run around with the ghosts “flying” behind them. At home, hang them around your porch. 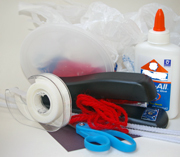 What You Need: two plastic grocery bags; white or clear lid (such as from whipped topping or oatmeal container); two white pipe cleaners; scissors; black construction paper; glue; stapler; cellophane tape; hole punch; yarn. How You Make It: Cut off the bag handles as well as any writing or logos on each bag. Cut 1- to 2-inch strips from the top of bag to about 1 inch from the bottom of the bag. (Do this with both bags). Fold white pipe cleaner into seam of one bag and secure with staples. Do the same with the other bag. Now, bend each pipe cleaner/bag into a semi-circle and insert into inside rim of lid and secure with tape. Do the same with the other pipe cleaner/bag. (They will overlap a bit.) Glue on construction paper ovals for ghost eyes. Punch hole in lid and hang from yarn. Spooky! Safety Alert: Plastic bags are a suffocation hazard. Please observe children closely when making this craft. This one is definitely a classic! These little ghosts come together quickly and make for a great treat on Halloween. You could also make them using Kleenex-type tissue and yarn. How You Make It: Stack tissue paper together, wrap around lollipop and tie with ribbon. (Preschoolers can practice bow-tying skills or a knot would be fine.) Use marker to add eyes. Imagine a classroom full of these spiders jiggling and dangling at Halloween time, or during a preschool theme about spiders and bugs! What You Need: disposable plastic cup, scissors, black marker, yarn. How You Make It: Using scissor points or other pointy tool, adult pokes small hole in bottom of plastic cup. Child makes spider legs by making 12 cuts from the top of the cup to about 1 inch from the bottom of the cup. (remember: Enjoy the Process! Precision isn’t a big deal.) For the eyes, cut two of the “legs” off at about 1 inch. Fold eyes upward and add eyeball using black marker. Opposite the eyes, cut off the back two “legs” so you are left with eight legs. Fold legs downward at the crease. Now, hang your wiggly spider with a knotted strand of yarn. “We tried it” tip: Because this craft involves the cutting of a fairly thick cup, it might be best-suited to older preschoolers with more-developed motor skills and experience with scissors. 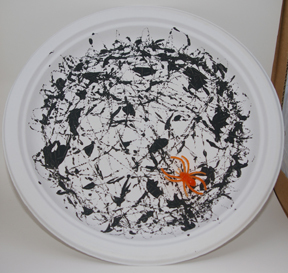 This is a quick Halloween craft in which kids get to watch what happens as marble roll around on the paper plate and make cool patterns. This technique is also fun when you use a variety of paint colors. Besides Halloween, this craft could be used with the movie or book Charlotte’s Web . What You Need: sturdy, white, high-rimmed paper plate (such as Chinet), black tempera paint, 4 to 6 marbles, plastic spider ring. How You Make It: Apply many tiny (1/8″ or so) dots of black paint scattered around the paper plate. (Adult might need to do this for the youngest kids.) Child places marbles in plate and gently rolls them around to create web-like designs. Once dry, place or glue spider ring in plate. You can cut off the ring part if you’d like. Safety Alert: Marbles can pose a choking hazard. Only do this craft with children who are developmentally ready to play with small objects. A whole classroom could make these and then line them up along a windowsill! Try writing each child’s name on his or her pumpkin. 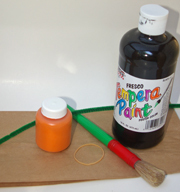 What You Need: paper lunch bag, orange and black tempera paints, paintbrush, rubber band, green pipe cleaner, old newspapers. 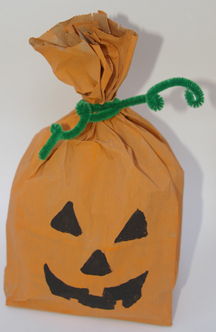 How You Make It: Paint the paper bag orange (You can just paint the front, or the whole thing). Let dry. Fill bag 2/3 full with crumpled-up newspaper. Use rubber band to close off top (Adult will probably need to help with that step). Twist green pipe cleaner around rubber band and curl ends to form stem. 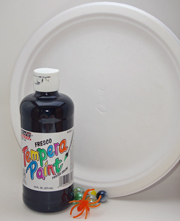 Decorate pumpkin with tempera paints.